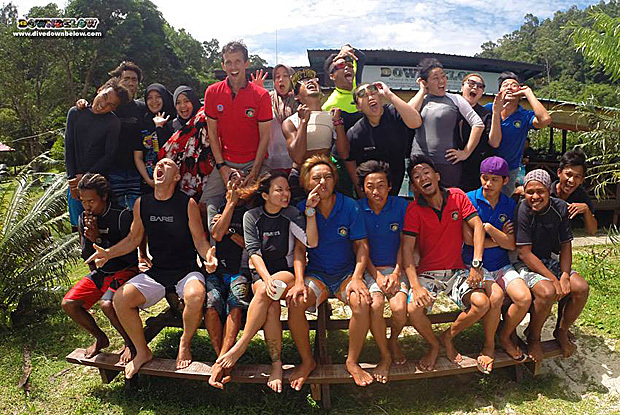 Fun at the island for both Dive Centre and Head Office staff! Home/News/Fun at the island for both Dive Centre and Head Office staff! Our staff truly embraces ‘living like dive downbelow’: a motto of our belief on the truly Sabah experience, which is all about the beauty of the marine, wildlife and adventure to be found in the ‘Land Below the Wind’! Many of our Head Office staff visited our premier PADI 5 Star IDC Dive Centre located on Gaya Island in the protected Tunku Abdul Rahman Park to experience our variety of exciting activities! Travel Consultants Jane and Lulu start their PADI Open Water Diver course under the experienced supervision of IDC Staff Welson, whilst Travel Centre Manager Magdalene continued her dive education on the PADI Advanced Open Water Diver qualification with IDC Staff Instructor Tim. Divemaster Kerry guides HR Manager Merl and Admin Assistant Vivi on our very popular snorkel safari program and Instructor Timmy conducted the PADI Discover Scuba Diving program for our Accounts Executive Rabiah and family members! The candidates of our September Instructor Development Course were also present with their Go PRO team mentors to practice their in-water teaching skills! All in all, there was a lot of excitement at every turn! Get in touch with our Head Office where our team can give you their firsthand experience of our Dive Centre and offer a multitude of options to create an amazing Sabah adventure with us! By Joanne Swann|2014-09-17T15:59:02+08:00September 17th, 2014|News|Comments Off on Fun at the island for both Dive Centre and Head Office staff!